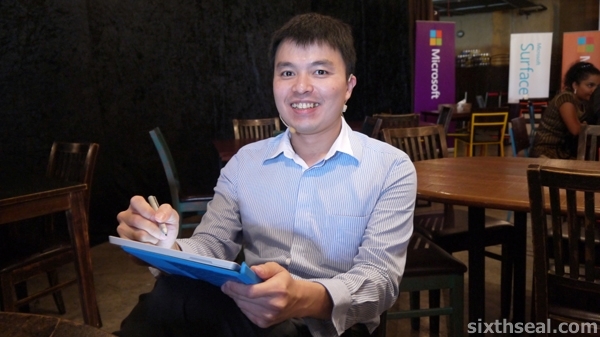 I’ve been using the Surface 3 for a couple of months now. I have the works – the Microsoft Surface 3 128 GB unit with 4 GB RAM, Surface 3 Type Cover, Surface Pen, and even the Surface 3 Docking Station! As someone who just started my own company, having a portable notebook is very important to me. The Surface 3 has basically replaced both my conventional notebook and tablet since I only need to bring this to meetings and while working on the go. 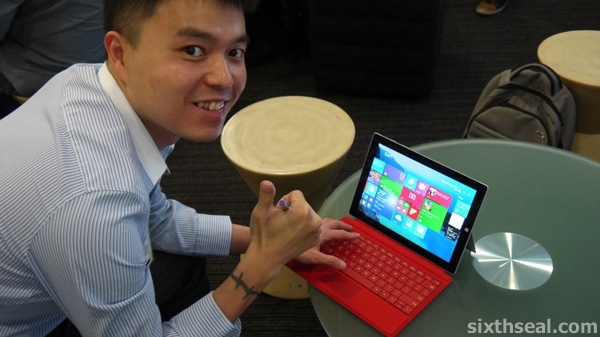 It’s truly an all-in-1 device to replace your notebook, PC, and tablets. 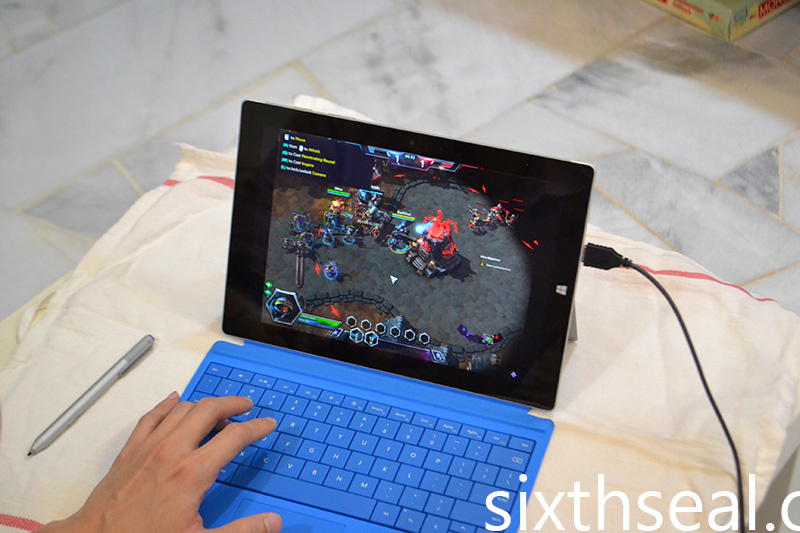 I can even run Heroes of the Storm on it! 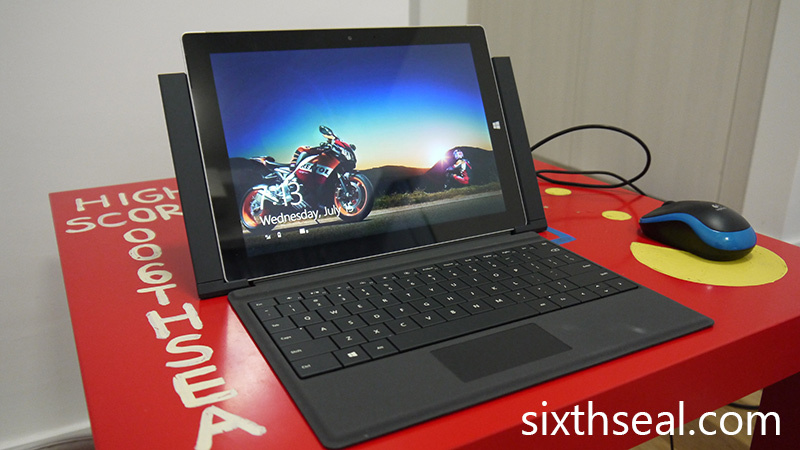 The quad core Intel Atom x7 processor inside the Surface 3 allows you to run all native Windows applications, which is the point of this device. Think of an app you want/need to run – Photoshop, Word, or Call of Duty. 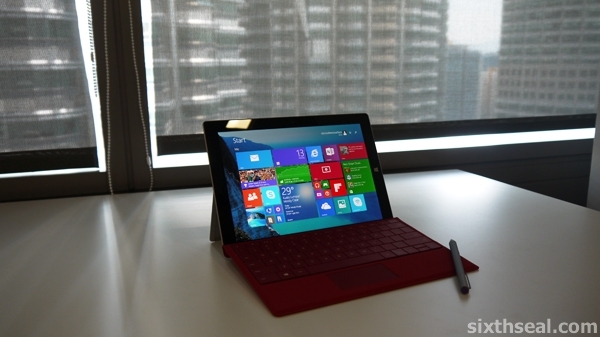 The Surface 3 can run it without problems since it runs ALL Windows programs, not just a pared down app. Of course, you can still use your favorite touch apps but what’s unique about the Surface 3 is that it runs all my essential desktop software smoothly. Stranger: OMG! Where did you download that app? Me: It’s not an app, it’s the full program. Stranger: What do you mean? You mean the program has been made into an app? Me: No, this is the original desktop software. Me: It’s a complete notebook – anything you can run on a PC, you can run on this. 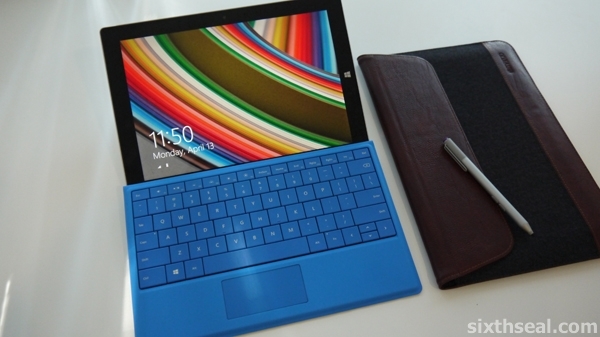 I can use my Surface 3 as a tablet or a notebook (with the Surface 3 Type Cover). I usually require the keyboard of the Surface 3 Type Cover to work as my line of work entails doing a lot of typing and I’m just used to a physical keyboard. 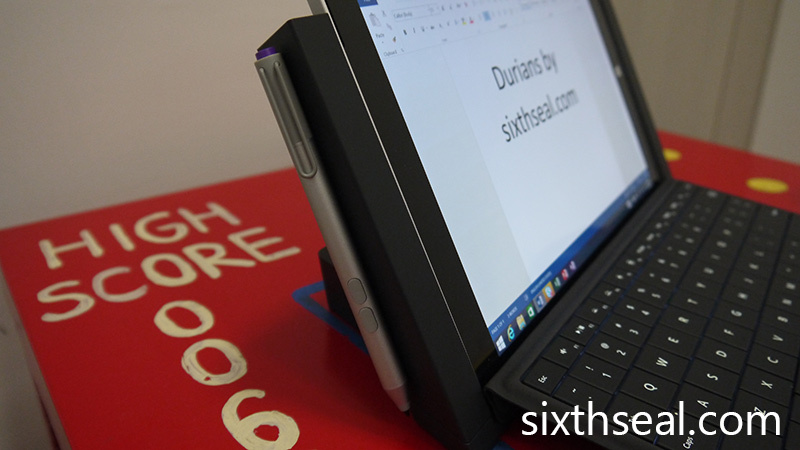 The Surface 3 is even more useful to me now that I have the Surface 3 Docking Station. The Surface 3 is equipped with a USB 3.0 port but I need more than that so I have to use a 4-socket USB port/extender when I come home to insert all my external hard disk drives, wireless mouse and smartphone charger/data cable. 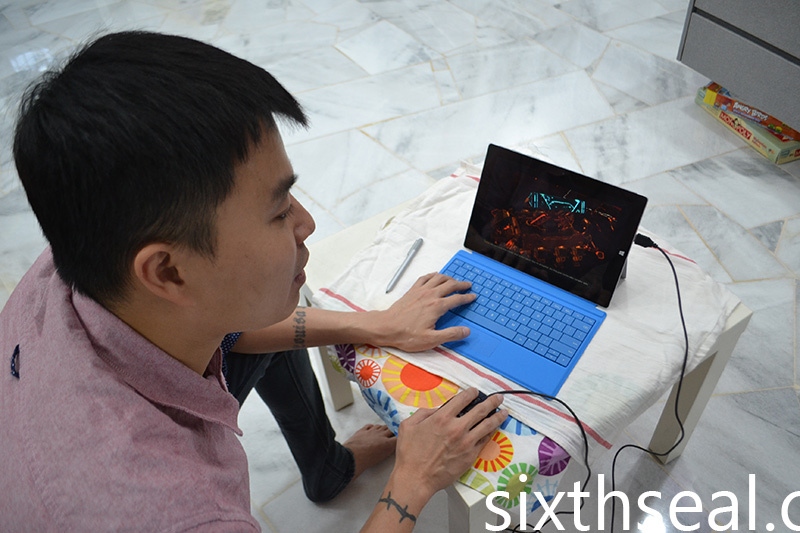 This is the thing that I needed to turn the Surface 3 into not just a tablet and notebook but a full-fledged PC! I can connect it to a HD LCD monitor, use the Gigabit Ethernet port for a more secure connection to my network, play music on the home speaker setup with subwoofers that I have with the audio out, and utilize the 2 x USB 3.0 and 2 x USB 2.0 ports. 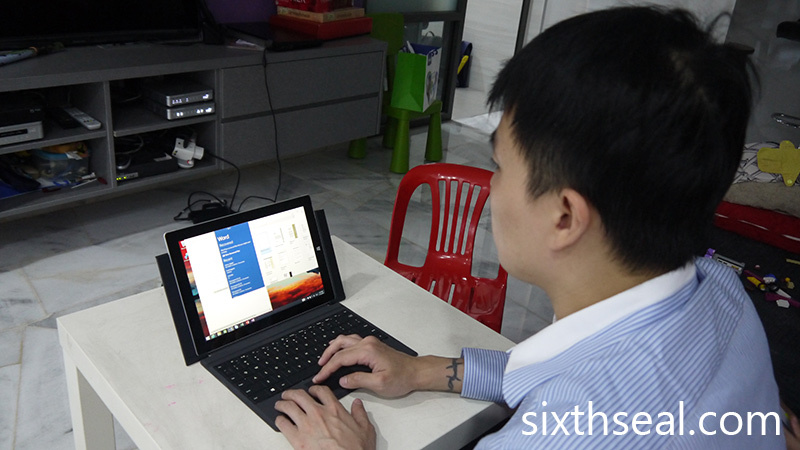 The Surface 3 Docking Station is really ideal for people wanting to get the most bang for their buck and using the Surface 3 as a notebook, tablet and PC. It also automatically charges the Surface 3 when it’s docked and there’s a Mini DisplayPort video output which you can use for a larger monitor (or in our case for watching movies). I’m not kidding, sometimes you download movies which has video or audio codecs which your television doesn’t support. You can use the Mini DisplayPort video output to go straight into your TV and not risk the Surface 3 from running out of battery coz it’s charging at the same time. There’s also a magnetic side that doubles as a nifty storage solution for the Surface pen so you don’t lose it as well as a security lock slot in the Surface 3 Docking Station, but so far I haven’t found any use for the latter. I don’t have any light-fingered friends or family but if you’re in an office environment it could be useful for you. I’ve been very happy with the Surface 3. 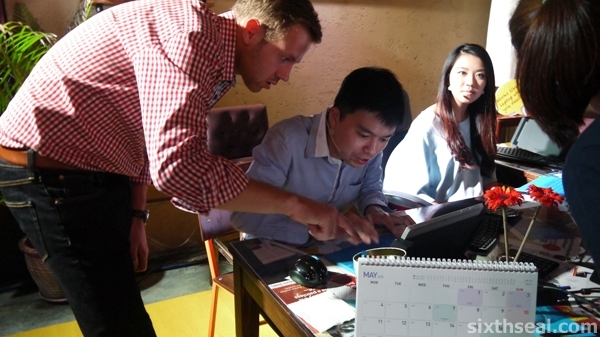 It’s been in use on daily basis and has replaced my notebook, tablet and PC with just one single device. It’s fast and the Surface 3 Docking Station was the final detail that allowed me to use it exclusively and relegate my old and slow PC to a cloud storage system. I only wish I can keep it coz it’s so integrated into my lifestyle now. 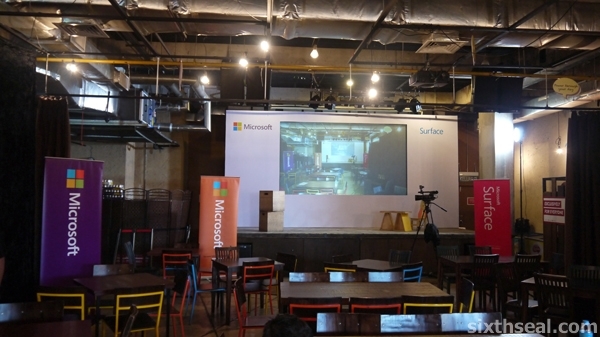 I was lucky enough to view this entire event from behind the scenes, as I was involved in the official Malaysian launch of the Surface 3 on the 5th of May 2015. 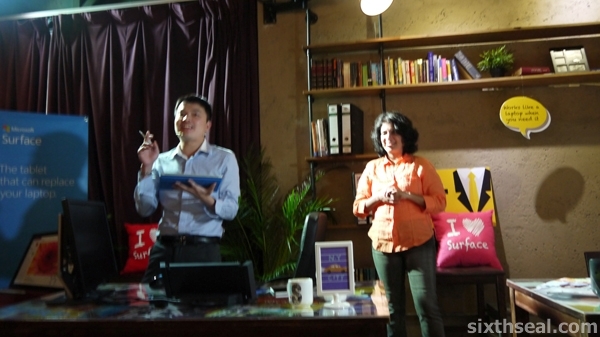 There were 4 guest presenters/speakers/influencers which were part of the event that day – 2 for Home and 2 for Office. 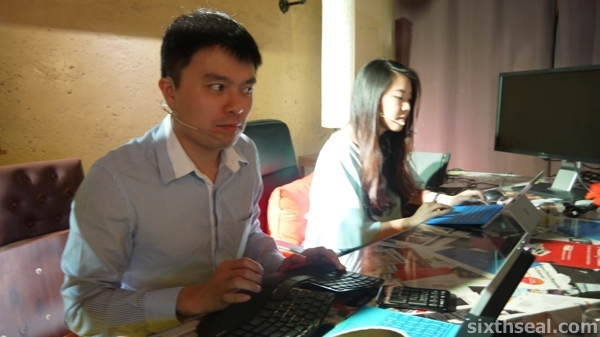 I was part of the Office group, together with Careen, my partner. The event started off quite early for us, I was there at 7:30 am for an 8 am rehearsal led by Rukmani where we ran through everything. Good thing breakfast (and most importantly coffee) was provided. Denise actually ran out and got me an iced latte – thanks for that! I got wired up for sound before the dry run. I’ll be talking about how the Surface 3 has helped me in my life, and do a quick run-through of the things I actually do on it. I was quite proud of that fact that I was actually doing things I would actually do during the entire event, nothing was scripted. I was even replying Facebook comments at one point! 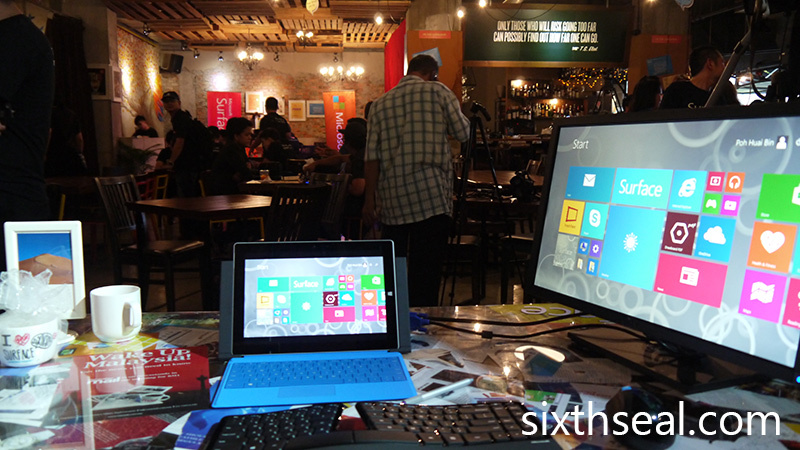 I had my Surface 3 hooked up to the docking station, which allowed me to use a wireless full sized keyboard and mouse, as well as the HDMI output to Extend or Mirror the contents of my Surface 3 to the large monitor on my table. 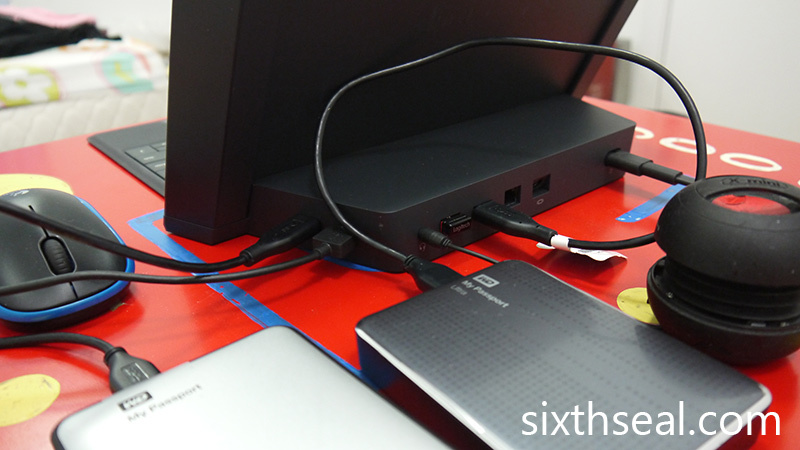 The Surface 3 Docking Station is capable of DVI/VGA/HDMI so it’s all covered there. I was a little worried that my personal account would be in full view on the large monitor they had setup for me on my table, but we were still alone at the time and the blinds were up. It had been decided in the previous meeting that the Home and Office sections will be flanking the stage and there will be full blinds/curtains to contain the scenes behind from prying eyes. We were slated to slip into the space and be in place at 1:50 pm latest. 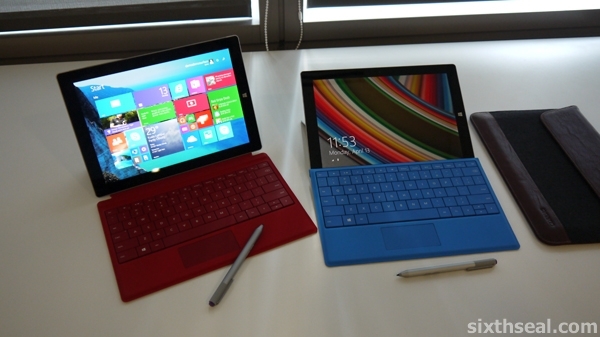 The actual Microsoft Surface 3 Launch started at 2 pm. 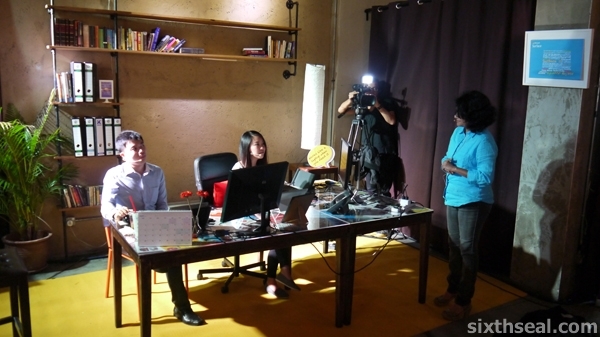 Thus, after lunch, we went behind the curtains and waited for our cue. 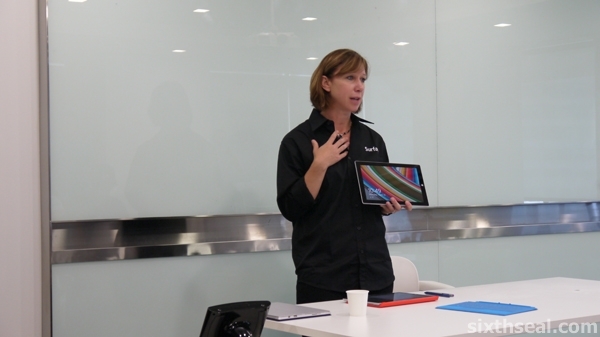 Careen was slated to talk first and then I’ll go on about the flexibility of the Surface 3 – in particular how the Surface Pen allows you to write naturally while resting your wrist/palm on the screen (a very nifty feature I love) and the 4 USB and Gigabit Ethernet ports on the docking station (useful to turn your Surface 3 into a PC). 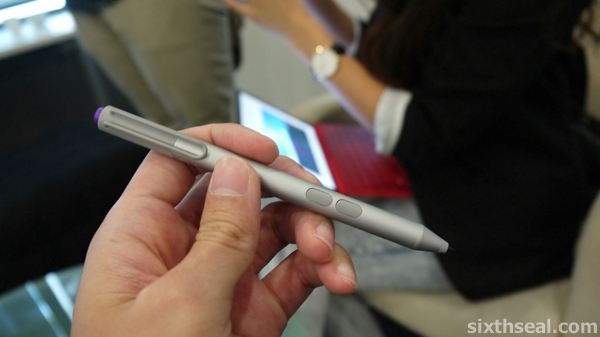 I also liked how there’s a natural place to the left of the Surface 3 docking station for your Surface Pen! It’s a magnetic side which allows you to store your stylus without losing it, a very important feature when you’re transitioning from tablet/laptop mode to full PC mode. I love little design features like this that helps make your life easier. 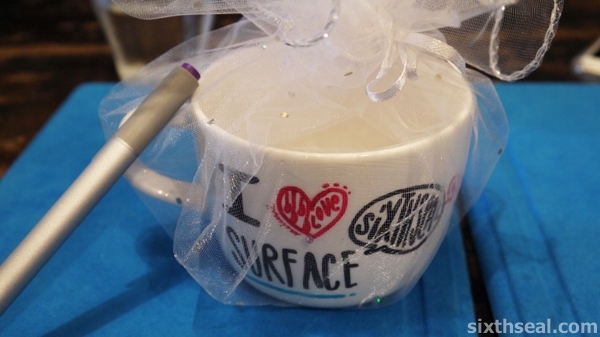 The Surface 3 launch even had a place where you can get customized mugs made with your name on it! 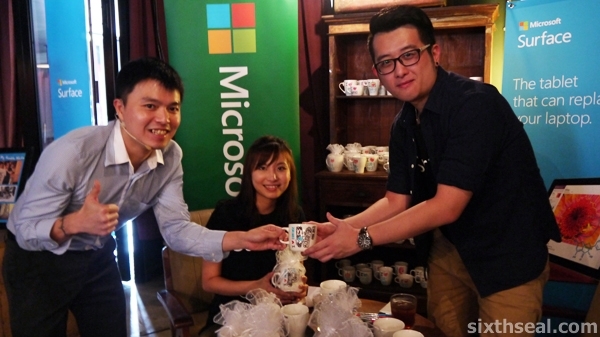 I had mine done in “sixthseal.com” and “Huai Bin” in two different cups. I asked the nice people there to do the second one only if there were leftovers and they were kind enough to oblige. 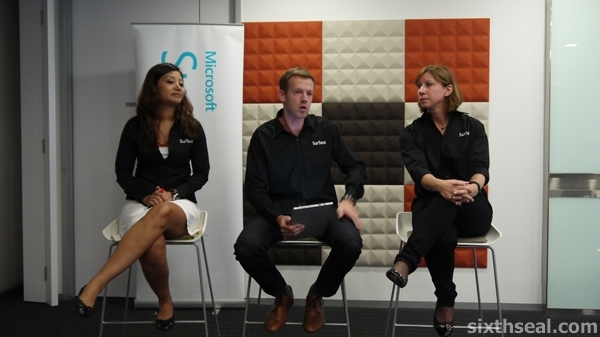 I only have photos of me that I asked my friends to take while I was on-stage (or beside the stage, rather) and it was a great experience to talk about something which I genuinely like, for I have indeed fallen in love with the Surface 3 during my time with it. 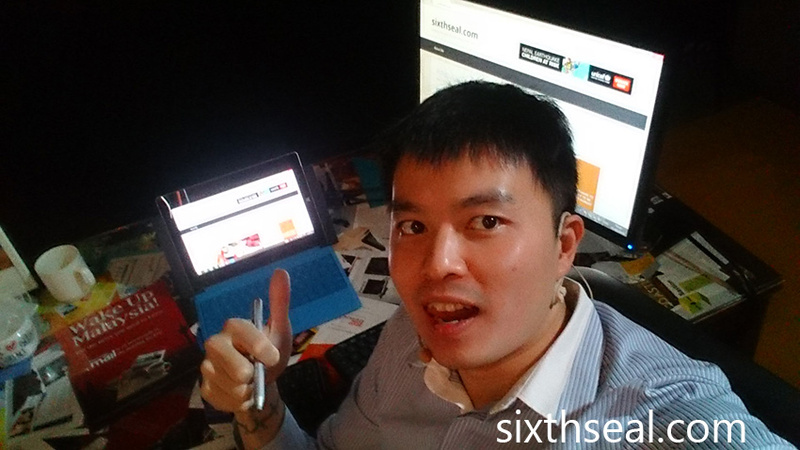 It’s so useful for work and play that I miss it when I returned the Surface 3. 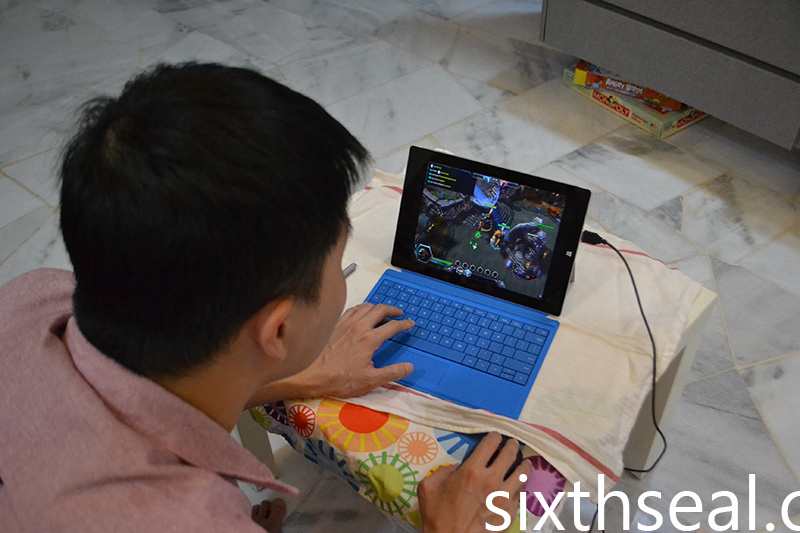 It’s so portable, it works like a laptop (can even run Heroes of the Storm on it), and it’s silent since the quad core Intel Atom x7 can run fan-less. You can check out the Surface 3 at any large electronics store (saw it at Harvey Norman during the weekend) and see if you like it as much as I do. 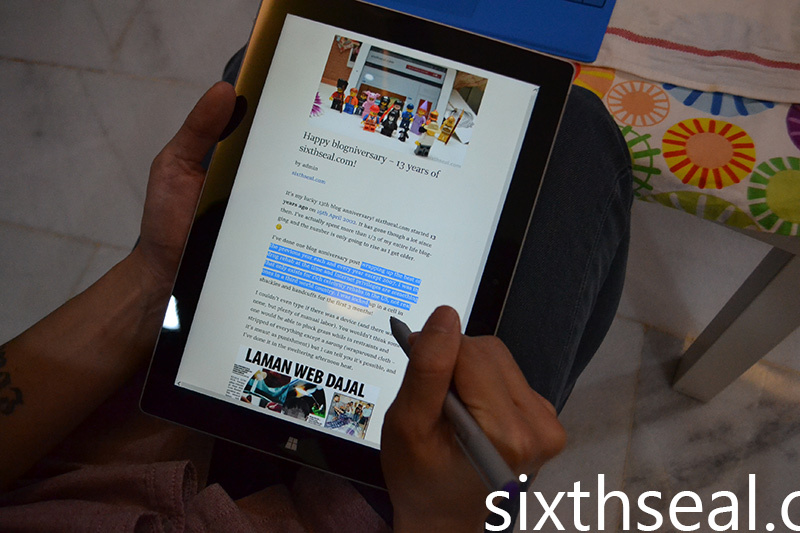 The Malaysian launch of the Surface 3 reveals the pricing to be RM 1,989 for the 64GB/2GB RAM version and RM 2,389 for the 128GB/4GB RAM version. It’s out now, so you all have the chance to see what I’ve been so enamored with for the past few weeks. It’s finally here! 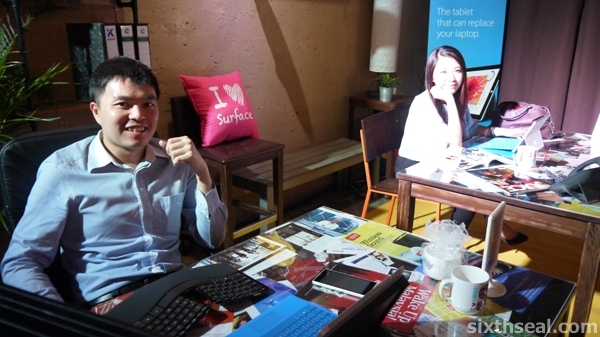 I had a sneak peak at the ultra-light Microsoft Surface RT during the Windows 8 launch in Singapore last year and was very impressed by it. 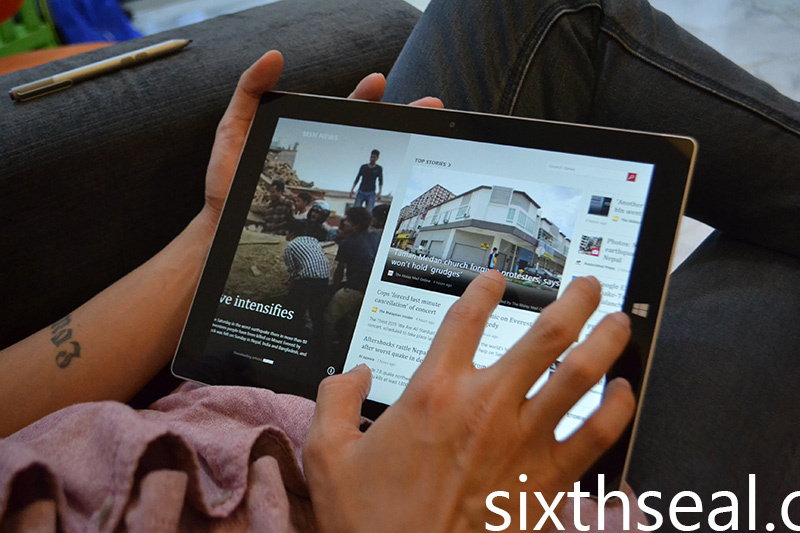 It’s a thin, sleek and amazingly crafted device functions and both a tablet and laptop! 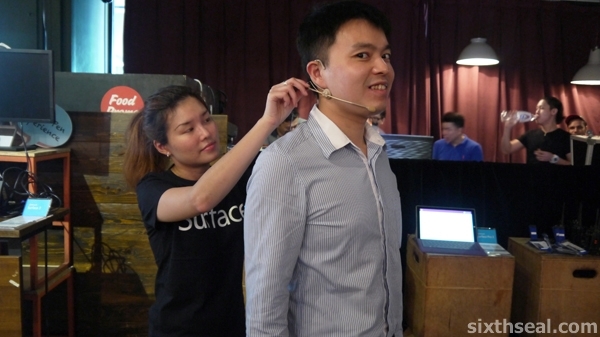 The Surface RT Launch Party was held in Publika on the 25th of April. There was a lot of people lining up to be the first in Malaysia to own one of these babies. 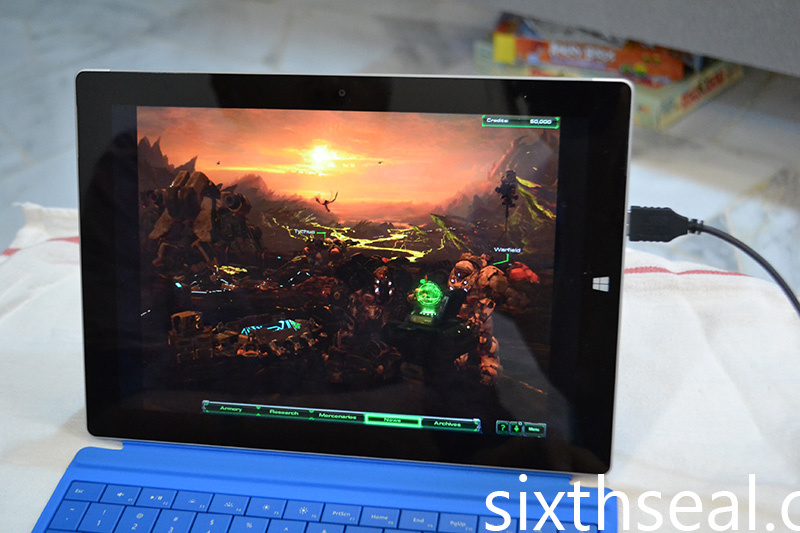 There’s even a custom-built skateboard from a Microsoft Surface device! 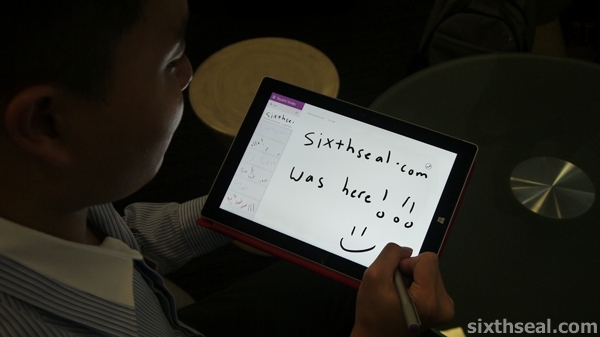 Carlos Lacerda, the Managing Director of Microsoft Malaysia came on stage on one of these to deliver his speech. 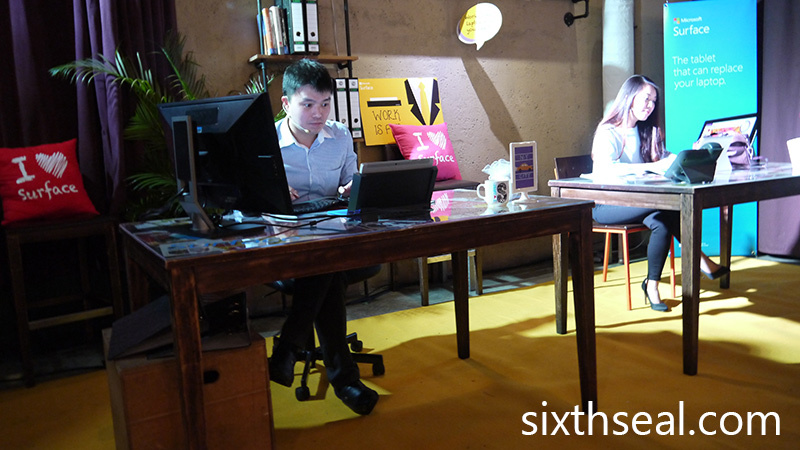 There was also a performance by a dance crew Elecoldxhot featuring Surface devices. I’ve seen them before and they really hyped up the crowd at the launch. 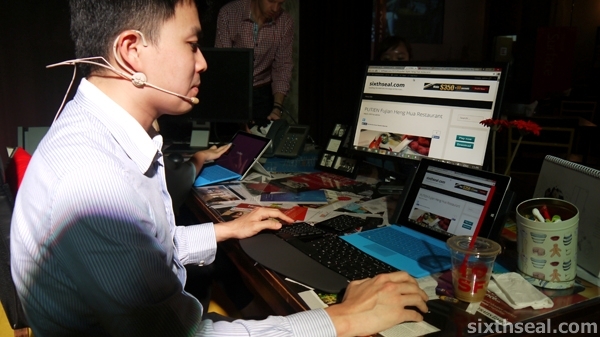 Danny Ong, the Chief Marketing and Operations Officer gave a demonstration of the capabilities of the Surface RT device. Mizz Nina also came on-stage to do an impressive choreographed song and dance routine. She is also an early adopter of the Surface and told us how using it has allowed her to write songs, review contracts and proposals while keeping in touch with her fans on social media and playing games at the same time! Everyone had a chance to check out the Surface in detail at the demonstration booths all around. It’s really quite impressive and loaded with cool features! 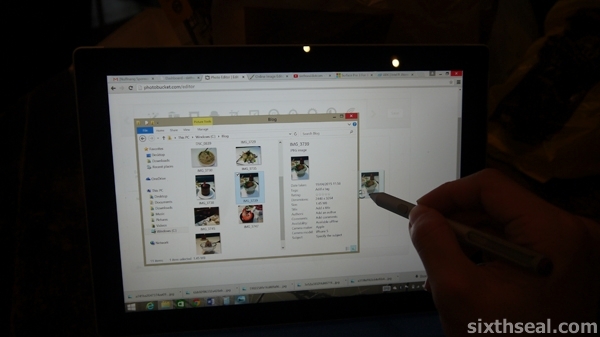 There’s a full size USB port on the Surface (as in the tablet, not the top – lame joke) which allows you to connect to all sorts of devices. You can plug in anything from a thumb drive to external card readers for your digital camera memory card. 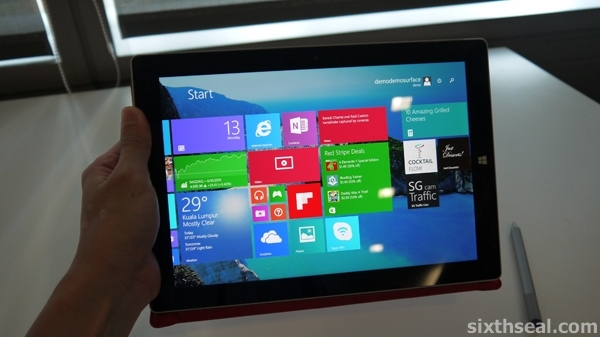 The Surface also has a microSD slot so you can expand the memory of the device or transfer files. 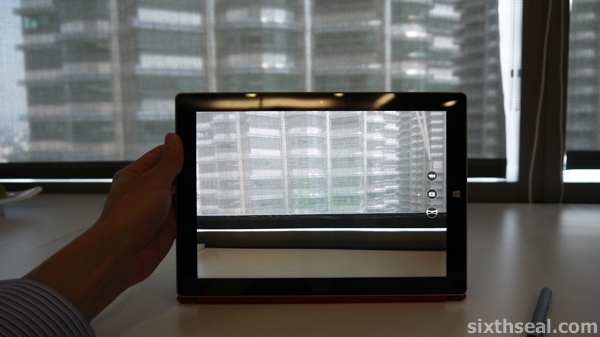 It’s a feature that is lacking in a lot of other tablets, and a very important one. It also had a HD video-out port so you can connect it to a large screen television to to show off your vacation photos at home to friends or present a slideshow during a business meeting. 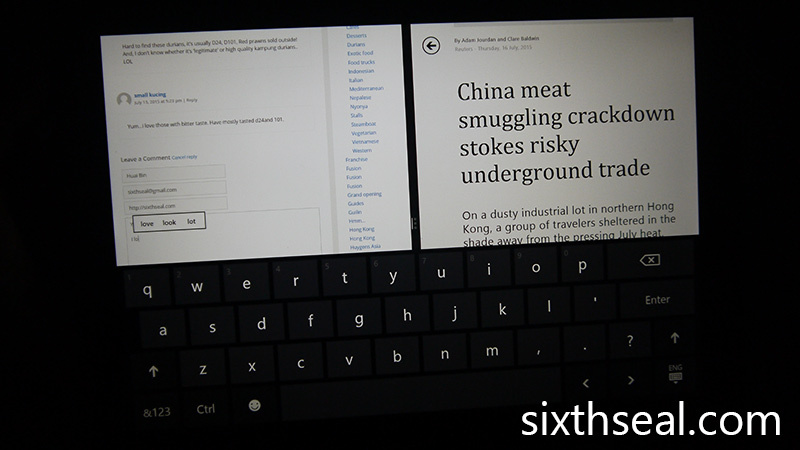 It’s the ports on the Surface that makes it so versatile. 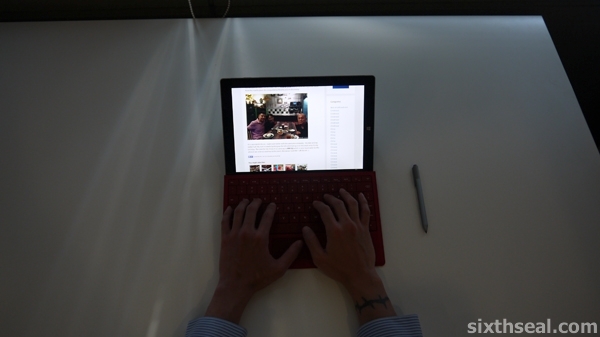 Unlike other tablets which are not designed to be a hybrid, the Surface does not require third party or aftermarket keyboards to turn it into a notebook. The laptop functionality is built natively into the tablet – the two types of covers comes with an magnetically attached keyboard! 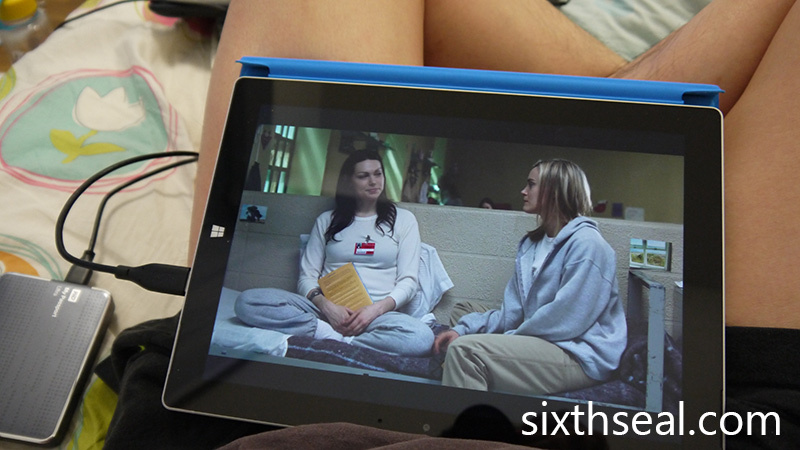 There’s a kickstand on the tablet that allows you to use it like how you’ll use a regular laptop. 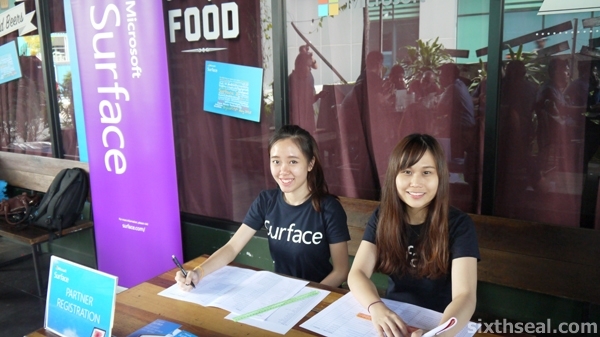 Surface starts at RM 1,549 and comes with Windows RT – a touch operating system that allows you to have the full Windows experience that you’re used to. 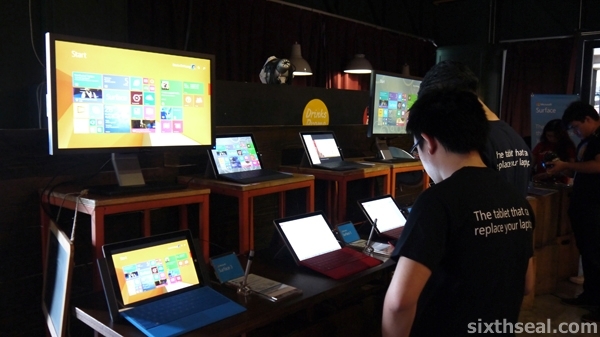 There’s Live Tiles and you can download the apps you want from Windows Store. 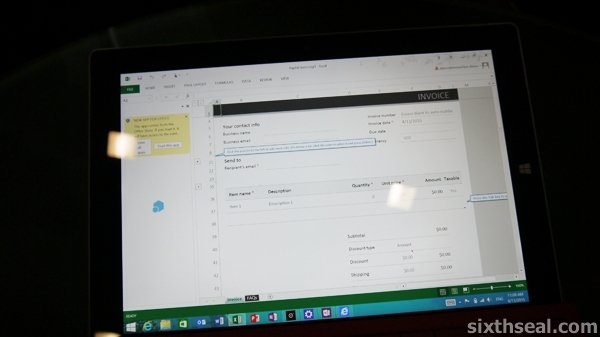 Microsoft Office Home and Student 2013 RT is also included so you can get all your work done as you would with a regular laptop! I was really impressed by it. Serious. Fun. Starts. 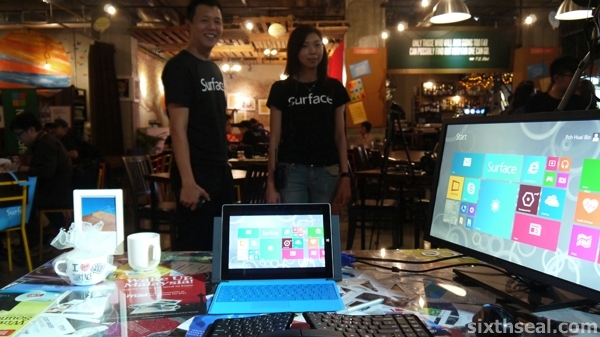 Meet Surface.